There's more to your dental visit than preventing or treating teeth or gum problems. We're also on the lookout for a number of potential soft tissue problems that could occur in or around your mouth. Here are 4 examples of such problems we can detect and help you manage. Lumps. Whenever you accidentally bite the inside of your mouth, the wound you create forms a protective layer of hard collagen. Unfortunately, the “callous” can rise higher than the surrounding cheek surface and easily get in the way of your teeth again. With successive bites and more scar tissue you'll soon notice a prominent lump. Although not a health danger, it becomes annoying with each successive bite. We can surgically remove the lump and flatten out the mouth surface. Canker sores. Known as aphthous ulcers, these round sores with a yellow-gray center and a red “halo” can break out on the inside cheeks, tongue or back of the throat. Unless they don't heal within a couple of weeks or seem to be increasing in frequency, they're nothing to worry about. They can, however, cause a burning or stinging sensation. We can reduce this discomfort and speed healing with over-the-counter ointments or prescription options like topical or injected steroids. Cracked mouth corners. Also known as perleche (from the French lecher, meaning “to lick”), your mouth corners can become dry and irritated and you may begin licking them to soothe the discomfort. Accumulated saliva can trigger a yeast infection, which can spread to other parts of your mouth. We can usually prevent this by prescribing antifungal ointments, and a steroid ointment to control inflammation. Mouth rash. 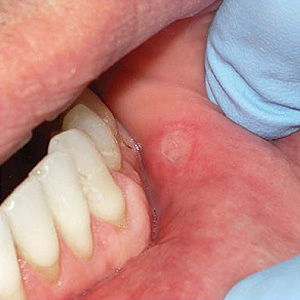 Peri-oral dermatitis is a red, scaly rash that appears around the outside of the mouth. Because it's often mistaken for acne or other conditions, it's often treated with topical steroids. This actually suppresses the skin's normal healing effects and can actually make the rash worse. The best way to treat it is to stop using any kind of ointment or cream and use only mild soap to wash the area. We can also prescribe antibiotics to help speed the healing process.